We recently attended Gourmet & Grapes, an extraordinary culinary event at The Sanctuary at Kiawah Island Golf Resort. 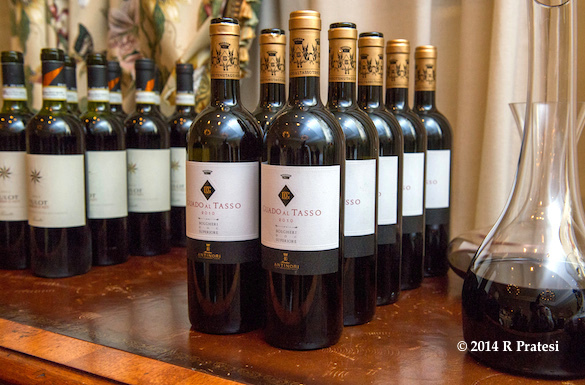 In its sixth year, this weekend filled with fabulous food and wine has special meaning beyond the fine dining and great wines; it is a benefit for cancer research at the MUSC Hollings Cancer Center in Charleston, South Carolina. If you’ve read the “About” section on this site or the article from attending Gourmet & Grapes last year, you will know that we have dealt with cancer on a very personal level. After battling Stage 4 colorectal cancer beginning in January 2005 and again in 2008, we are all too familiar with this terrible disease. Far too many of us have family members and close friends whose lives have been dramatically changed by a cancer diagnosis. We were honored to attend this year’s Sixth Annual Gourmet & Grapes Weekend and support their efforts to raise money and awareness for cancer and cancer research. It seems that each year there are several new culinary events added to the already long list around the country and the established food and wine events grow in size and congestion. However, this event is very different. The elegant affair hosted at The Sanctuary is focused on giving and not just consuming food and wine. The monies raised during the event and the proceeds from the auction go to a very important cause. To view the video in high definition, please change the settings to 720 p.
It’s exciting to see the Gourmet & Grapes Weekend expand and the growing success of this Kiawah Island affair. Raising approximately $650,000 over the past six years, this year’s auction is sure to add significantly to that total. 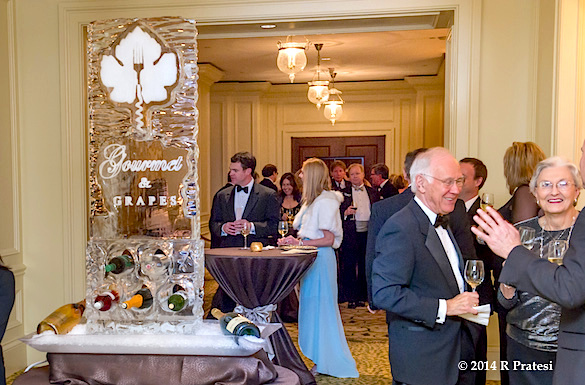 We attend many culinary events and in our opinion, this ranks as one of the premier food and wine events in the South. To kick off the weekend in style, the culinary team from Kiawah Resort combined their talents for Friday evening’s Epicurean Affair. Featuring wines from Jordan Vineyard and Ste. Michelle Wine Estates, highlighting Antinori Wine, this black-tie dinner was the perfect start to the weekend-long festivities. From the first course of Rabbit Chop with Heirloom Squash, Candied Pumpkin Seeds, and Pomegranate created by Chef de Cuisine, Ryley McGillis of Jasmine Porch (The Sanctuary), to the dessert finale of Chocolate Cherry Slice, a Flourless Cake with Cherry Cremaux, Dark Chocolate Sorbet, and Caramelized Katafi ,executed beautifully by Pastry Chef Robert Brehm, the food and wine pairings were outstanding. 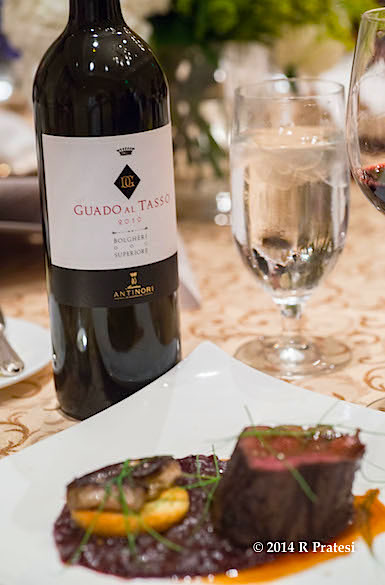 A very special wine, 2010 Antinori Guado al Tasso, was particularly memorable when paired with the third course of 130 degree Palmetto Beef Tenderloin, a local beef, served with Cabernet Braised Georgia Vidalia Onion, Pan Seared Hudson Valley Foie Gras, and Ocean Room Black Truffle Bordelaise. This course was beautifully prepared by Chef de Cuisine of the Ocean Room, Jason Rheinwald. such a great time and a joy to be a part of this event!